The Ballet Arts Ensemble (BAE) is a pre-professional performance company affiliated with the Center for Ballet Arts. 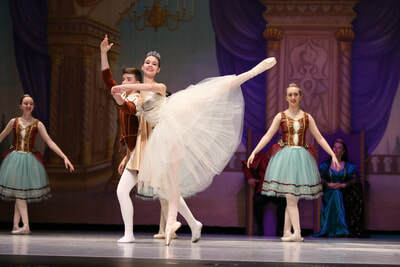 A student may be invited to join the BAE once they have met the following criteria: they are at least 14 years of age, have had sufficient dance training and background, and are enrolled in at least two pointe classes, plus ballet technique, modern dance and a conditioning class per week. A minimum of six classes is required, at which time the Choreographic Workshop is offered free of charge. The Choreographic Workshop is a class specifically designed to provide necessary training and rehearsal time to members of The Ballet Arts Ensemble.The BAE performs several times each year. A Fall Concert is offered in October and “Nutcracker in a Nutshell” is performed each December. The BAE has served as a member of the Fairfax County CAPS Program since 1997. The BAE was a member of the South Eastern Regional Ballet Association (SERBA) from 2001-2011 and is a founding member of the Virginia Dance Coalition (VDC). Ensemble members have been accepted to many of the nation’s foremost summer dance programs including American Ballet Theatre, the Joffrey Ballet School, the Rock School of Pennsylvania, Pittsburgh Ballet Theatre, Boston Ballet, North Carolina School of the Arts, Ballet Metropolitan, San Francisco Ballet and Jacob’s Pillow and eight dancers from the Center for Ballet Arts have been chosen for the prestigious Virginia’s Governors’ School in recent years.